Some of nature's most remarkable and unique treasures are set to dazzle the public when they go on display. The Vault, a new gallery at London's Natural History Museum, will showcase a collection of gems, crystals, metals and meteorites from around the world. Museum curator Alan Hart said the specimens were chosen for "their beauty, rarity and history". 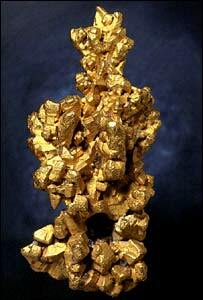 They include a hefty gold nugget, a Martian meteorite and 296 coloured diamonds. Mr Hart described the collection as "the creme de la creme" of the mineral world. He said: "We designed this exclusive gallery so we could showcase the best of our collections and include in that some dazzling loans." One of these loans includes the famous Aurora Collection, which consists of hundreds of exceptionally rare diamonds, ranging in colour from blood red to emerald green. "Gems like these were not meant to be imprisoned in a dark underground safe for the momentary pleasure of a few eyes," said Alan Bronstein, the co-owner of the collection. 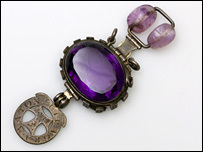 The Vault's team said the gallery would reveal some of the fascinating stories behind the treasures, from Heron-Allen's cursed amethyst to the Latrobe gold nugget, which was unearthed during Australia's "gold rush". Mr Hart told the BBC News website: "Each specimen has a great narrative - whether it is a scientific narrative, cultural dimension or historical fact." 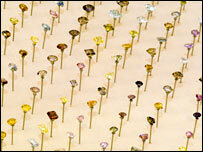 The team also said the array would give an insight into the science behind the specimens. 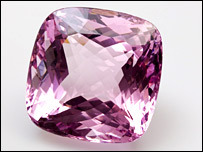 Displayed next to many of the glittering gems, including a vivid pink beryl from Madagascar, are the crystals or crystalline material from which they were cut. This will give visitors a better idea of the Earth processes that yield such remarkable items. Mr Hart said: "We wanted to celebrate some of the rarest and unique gemstones, metals, meteorites and crystals as a natural substance. "I think many people may have gemstones and they may not realise where the raw materials come from." He added: "Many of these are like nature's artwork- they are just so spectacular." The curator said it was impossible to place a value on the Vault's display. He explained: "Some of the items are so unique; they are literally priceless, especially in terms of their scientific value." 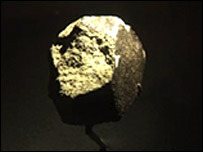 One such item is the Nakhla, a rare Martian meteorite which crashed to Earth in Egypt in 1911. Mr Hart said: "By studying these meteorites we can find out about the origins of the Solar System and maybe even the origins of life itself."